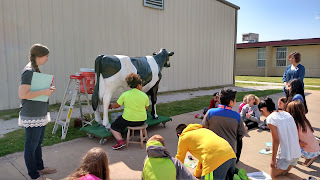 was on her best behavior today as Westside Elementary students milked for the first time. It's always fun to watch the kids try their hand at milking the cow and give them first hand information about dairy farming and Arkansas agriculture. importance of agriculture to our everyday lives.